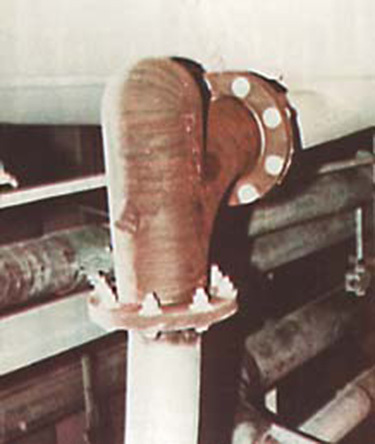 FIGURE #1: One of the HammerTek Smart Elbow® deflection elbow in the pneumatic line carrying grain to storage areas. The use of this short-radius elbow allows the pneumatic line to hug the wall, saving plant space. FIGURE #2: The HammerTek Smart Elbow deflection elbow sends "fines" from a line on the floor upwards to the cyclone. These fines are small food particles which are later recycled back into the production line. The upper end of this vertical run is shown in figure 3. FIGURE #3: This is the upper end of the vertical run shown in Figure 2. The elbow used here turns the fines 90 degrees for entrance into the white cyclone. Figures 1 to 3 all show locations where earlier long-radius elbows gave very poor service. The HammerTek elbows have as yet shown absolutely no wear, and created no trouble of any kind. It happened again and again. 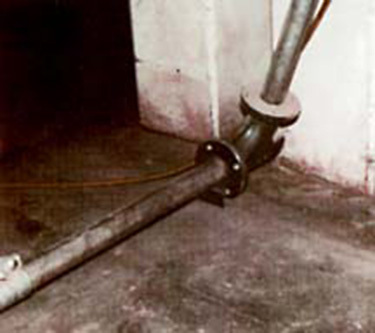 At the Pet Foods Division of Quaker Oats in Rockford, Illinois, the stainless steel elbows in their pneumatic conveying systems were wearing out every three months, or even less. Elbows were wearing through in three different systems: Two of the systems carry grains (barley, soy bean meal, soy bean hulls) from storage areas to receiving tanks for further processing. The third problem was in a line that sends "fines" (dust-sized food particles) back into the process for recycling. The fines are sent from a line on the floor up towards the cyclone, often requiring turns of 90 degrees. Pet Foods had been using long-radius elbows. Unfortunately, those elbows gave very poor service, wearing out far too quickly. The resultant shutdowns and the clouds of grain and chaff floating through the plant were demanding more and more maintenance time. These problems were eliminated three years ago for Pet Foods. 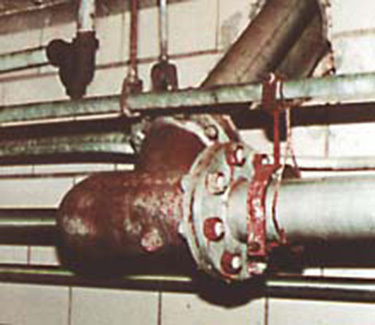 They bought eleven cast iron elbows of an entirely new design, and installed them where conventional stainless steel elbows had given the worst service. This elbow, called the Smart Elbow® deflection elbow, is manufactured by HammerTek Corporation of Bethlehem, Pennsylvania. Since the original installation there has been no wear, no failures, and no plugging. The Smart Elbow design is a small, compact elbow with a spherical chamber. It works on an entirely different principle than most pneumatic elbows. Here's how it works: Some of the conveyed particles form a slowly rotating; self-renewing ball in the chamber. Other particles of moving material are deflected by the material suspended in the air and given off by this soft rotating ball. Instead of impacting and eroding the elbow walls, the material is gently deflected into the direction change. Even the material in the chamber is undamaged. Here's why: The spherical mass of material is slightly off-center so that the soft ball rotates, absorbing new material at the top and losing material at the bottom. The ball, therefore, is self- renewing and the gentle deflection of material is constant. Engineers at Pet Foods are not nearly so interested in the theory of the elbow, as they are in the results. Bob DiCanio, Engineering and Maintenance Manager, says he cannot think of a single problem since the elbows were installed. They were installed in 3-, 4-, and 5-inch diameter lines. not a single shutdown due to plugged elbows. The people at Pet Foods cannot find enough good things to say about the Smart Elbow units.